A departure in appearance from the other cabinets in our range. The Martlet is a four-tray cabinet that is particularly suitable for the specialist collection. Its compact dimensions make it ideal to hide away in a wall safe or strong box, yet up to 100 coins may be housed in its solid mahogany trays. The Martlet's polished case is fitted with a laminated lid, brass lever lock and brass hinges. 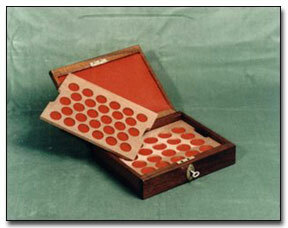 A soft red felt pad is fitted to the lid to hold the trays firmly in position when the case is locked.